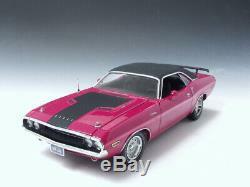 THIS PANTHER PINK 1:24 (NOT 1:18 CAR) WITH PINK SIDE STRIPE, YES THAT WAS A REAL FACTORY OPTION ON THE RT 1970 CHALLENGER. JUST LIKE THE 1:18 SCALE CAR, BUT THIS IS A 1:24 CAR IS THE SAME SUPERB QUALITY THAT HIGHWAY 61 GIVES. THE CAR I HAVE IS A MINT CAR AND MINT BOX. A GREAT PIECE TO PUT ON YOUR DESK IN YOUR OFFICE OR A SHELF. YOU WANT A SUPER EXSAMPLE OF THIS CAR. HATE TO GIVE IT UP, BUT NEED TO SELL. From a smoke free home. A MUST FOR MOPAR FANS 1970 RT DODGE CHALLENGER / Only have one that is it. ON PRO DISPLAY, SMOKE FREE HOME. CAR WILL BE PACKED VERY CARFULLY. Any questions please go threw questions asked in any. MANY PHOTOS ARE ON A QUALITY GOLD PAPER, WHICH IS MORE EXPENSIVE TO USE, BUT MAKES PHOTOS more vivid color and over all a quality photo. I TRY TO GIVE MY CUSTOMERS QUALITY PHOTOGRAPHS. ALL PHOTOS MADE AT PRO LAB. CLASSIC rock photos IN 5 BY 7 OR LARGER. ASK FOR INVOICE ON MORE THEN ONE WIN. ALL ORDERS ARE SENT WITH CARD BOARD AND CAREFULLY PACKED. ORDERS ARE MAILED 2 DAYS A WEEK. NEW AUCTIONS WEEKLY, SAVE ME AS A FAVORITE, THANK YOU SPECIALIZING IN 60`s & 70`s AND BEYOND ROCK PHOTOS. The item "HIGHWAY 61 1970 DODGE CHALLENGER PANTHER PINK W LIGHT PINK STRIPE 124 SCALE WOW" is in sale since Thursday, April 11, 2019. This item is in the category "Toys & Hobbies\Diecast & Toy Vehicles\Cars\ Racing, NASCAR\Other Diecast Racing Cars". The seller is "worldgems77" and is located in New York. This item can be shipped to United States, Canada, United Kingdom, Denmark, Romania, Slovakia, Bulgaria, Czech republic, Finland, Hungary, Latvia, Lithuania, Malta, Estonia, Australia, Greece, Portugal, Cyprus, Slovenia, Japan, China, Sweden, South Korea, Indonesia, Taiwan, Thailand, Belgium, France, Hong Kong, Ireland, Netherlands, Poland, Spain, Italy, Germany, Austria, Bahamas, Israel, Mexico, New Zealand, Philippines, Singapore, Switzerland, Norway, Saudi arabia, Ukraine, United arab emirates, Qatar, Kuwait, Bahrain, Croatia, Malaysia, Chile, Colombia, Costa rica, Dominican republic, Panama, Trinidad and tobago, Guatemala, El salvador, Honduras, Jamaica, Bermuda, Brunei darussalam, Bolivia, Jordan, Sri lanka, Luxembourg, Macao, Paraguay, Uruguay.